Geena Davis has made a lasting impression as an actress both on film and television in her roles in "Beetlejuice," "Thelma and Louise," "A League of Their Own," "The Accidental Tourist" and "Commander in Chief." Her performances have resulted in acclaim and a lengthy career both in front and behind the camera. It's also garnered her a Golden Globe and an Oscar. Davis is just as committed to her work for gender awareness and diversity in film and television. She founded the research-based Geena Davis Institute on Gender in Media, to educate, and influence, the entertainment industry with regard to gender representation on screen. Davis also founded the Bentonville Film Festival, which showcases films featuring minorities and women in both cast and crew and which guarantees distribution to the festival's winners. Geena Davis joined Jesse on Bullseye in 2016 and spoke about gaining confidence in voicing her opinions on set, how she feels about being recognized in public and how quieting her inner-critic helped her to almost qualify as an archer for the Summer Olympic games. Today, her work at the Geena Davis Institute on Gender in Media is still going strong and they're doing a lot of really insightful, fascinating work. You can also see Geena Davis on the new season of "Grey's Anatomy" on ABC. Click here to listen to Geena Davis's interview on YouTube. Make a few clicks on the internet and you'll run across ten fake "Deep Thoughts," and if you're lucky, a few real ones. Our guest Jack Handey created the seminal "Saturday Night Live" interstitial segment and authored several book collections of the material. He also wrote numerous other classic Saturday Night Live sketches, from "Happy Fun Ball" to "Unfrozen Caveman Lawyer." He's been writing in The New Yorker's Shouts and Murmurs section, and these writings, plus work for Outside Magazine and other publications, have been collected in the hilarious "What I'd Say To The Martians: and Other Veiled Threats." We spoke to Jack in 2008. What's he up to lately? Jack is still writing for The New Yorker, still putting out books, too. His latest book is "Please Stop The Deep Thoughts," which just came out last year. 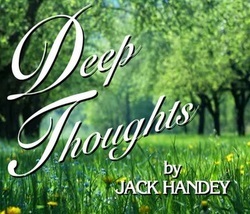 Click here to listen to Jack Handey's interview on YouTube. Jesse on the lingering amusement provided by the absurd and simple website, Zombo.com. Click here to listen to Jesse's Outshot on Zombo.com on YouTube.